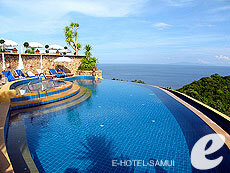 Samui Island is one of the best resort islands in Asia, which is located in western Gulf of Siam . The picturesque fine white sandy beaches with swaying palm trees attract people from all over the world. It also offers easy access to Phangan Island which is famous for its full moon parties and Tao Island which boasts a beautiful coral reef. 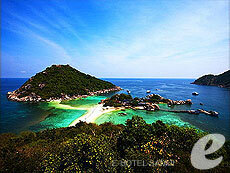 Take a day trip to Tao Island to enjoy scuba diving or snorkelling, or kayaking tour to Ang Thong Islands. You can also enjoy golf, spa, safari tours, and exciting nightlife on the island. 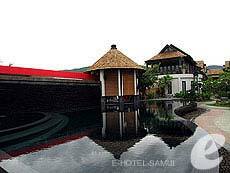 Have a relaxing holiday in the idyllic setting. 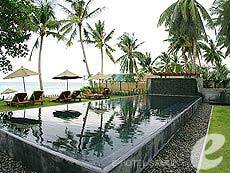 Pavilion Samui Resort is located at the northern part of Lamai Beach. It reopened after a renovation in 2004 as a stylish boutique resort. The new building offers rooms with bathtub on the balcony. The resort also has an excellent spa and an Italian restaurant. 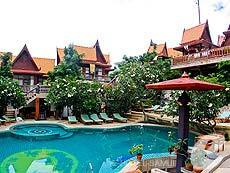 It is just a few minute walk from downtown Lamai. The Lodge is a cozy guest house located in the heart of Bophut’s Fisherman’s Village, just a few steps to the beach. The rooms are simple, but tastefully decorated with wooden furniture. There are many nice shops and restaurants around the hotel. 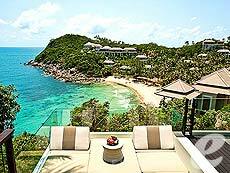 Opened in 2010, Banyan Tree Samui is a 5 star spa resort overlooking the sparkling blue waters of Lamai Bay. This is the newest properties of Banyan Tree Group, which owns luxury spa resorts in popular tourist destinations such as Phuket and Maldives. 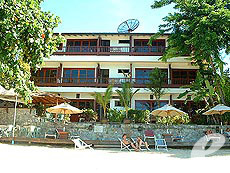 The all-villa resort is nestled on a slope which surrounds the private beach. The luxuriously appointed villas are perfect for honeymooners and couples.